"I want to show that our differences can be a source of strength instead of a cause for hatred and division” stated Mirsad Hadžikadić, UNCC professor who ran for president of Bosnia-Herzegovina in its October 7 elections. Bosnia was one of the six republics of Yugoslavia until that country was torn apart by warfare during the first half of the 1990s. More than 200,000 people were killed, and Bosniaks (Bosnian Muslims) were the target of genocidal violence committed by Yugoslav and Serbian forces. 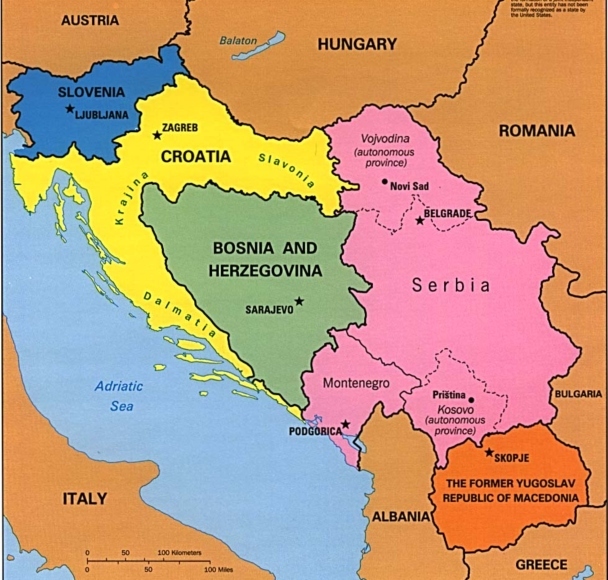 The war resulted in the partial dismemberment of Bosnia-Herzegovina, roughly half of which was handed to Serbian leaders. For many centuries Bosnia and its capital Sarajevo had been seen as a land of peaceful coexistence and relative harmony in the Balkans. A series of five lecture/discussion events at UNC Charlotte this fall will focus on Bosnia’s 2018 elections. Dr. Hadžikadić, a prominent figure in Charlotte’s large Bosniak (Bosniak Muslim) community as well as on our campus, came to the U.S. as a Fulbright Scholar and has been with UNCC since 1987. He is founding executive director of the Data Science for Social Good Initiative and professor of software and information systems. Wed., Sept. 12: “The Disintegration of Yugoslavia, the Dayton Accords and the Formation of Bosnia and Herzegovina.” Presenters: Dale L. Smith, Professor of Global Studies, UNC Charlotte, and Kristina Drye, a UNC Charlotte graduate currently pursuing a Masters in Security Studies at the School of Foreign Service, Georgetown University. BECAUSE OF THE APPROACHING STORM: THIS EVENT WILL BE HELD AT 11:15am - 12:05, same date (Sept. 12), in McInery 124. Wed., Sept. 26: “The Political and Electoral Institutions of Bosnia and Herzegovina.” Presenter: Dino Hadić, Doctoral candidate in political science, Washington University. Wed., Oct. 3: “The 2018 Presidential Election: Parties and Candidates.” Presenter: Suad Arnautović, Professor of Political Science at the University of Sarajevo and member of the Bosnia and Herzegovina Central Election Commission. Wed., Oct. 17: “Presidential Election Results and What They Mean for Bosnia.” Panel discussion with participants to be announced later. Mon., Oct. 22, Center City: A discussion with Mirsad Hadžikadić about his campaign experiences. All events except the Oct. 22 discussion will be from 5:30 to 7:30 p.m. in Room 281 of the College of Health and Human Services on UNC Charlotte’s main campus. Visitor parking is available in the Student Union parking deck. No registration is required. Bosnia Herzegovina has a complicated three-person presidency whose members collectively serve as head of state. If successful, Hadžikadić will be the Bosniak president and will serve a four-year term. He is on leave from UNCC this semester while campaigning. Bosnia-Herzegovina is deeply divided along social, religious and cultural lines and, according to many observers, is increasingly at risk of dissolution and absorption by its neighbors, Serbia and Croatia. As a Bosnian, Hadžikadić says that he wants his country to unite and stand on its own, and eventually to be welcomed into the European Union and NATO. The lecture series is cosponsored by the Department of Global Studies, the College of Liberal Arts & Sciences, the College of Computing and Informatics, and the Office of International Programs at UNC Charlotte. Bosnia and Herzegovina today. 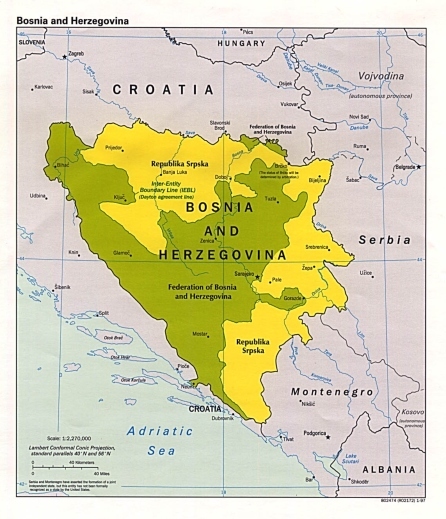 The "Republika Srpska" occupies roughly half the territory of historic Bosnia.